2. 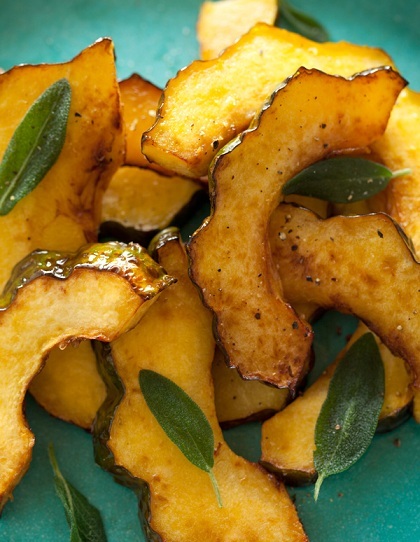 Place squash sliced onto a baking sheet and drizzle with oil. Season with alt and pepper and gently toss together. 3. Sprinkle tops of squash with brown sugar. 4. Roast squash for 35 to 40 minutes occasionally tossing around, gently, to avoid sticking. 5. 7 to 10 minutes before roasting is completely, brush a small amount of maple syrup over each piece of squash and finish roasting. 6. Top with fried sage, if using, and serve warm.